think4D® Inc. is a global leader in high quality direct printing, printed decorations, and registered-to-print thermoforming. Our outstanding plastic packaging solutions are created by integrating specialized print and precision thermoforming technologies, adding new dimension, product understanding, and excitement to packaging that is proven to enhance shelf presence! We offer a full portfolio of services to assist in all stages of development from initial design to supply chain production, and as an employee-owned company we are committed to providing superior quality and service to our customers. Our central sales office is located in New Jersey, and all of our products are produced within North America, which gives think4D several advantages to deliver shipments quickly with shorter lead-times required than many of our competitors. Although think4D’s technology and concept was developed several years earlier, the company was bought by Friesens Corporation in 2009, and was quickly transformed from an invention into a patented manufacturing process with a high volume, state-of-the-art facility. As an internationally acclaimed book manufacturer with over 100 years of business, Friesens Corporation acquired think4D in alignment with their growth strategy for expansion through additional print related business. The fusion of Friesens’ passion for printing and think4D’s cutting-edge thermoforming technology is reshaping the market and setting new trends. Packaging is the first point of contact that consumers have with a product on shelf, and it can have a significant impact on quality perception. 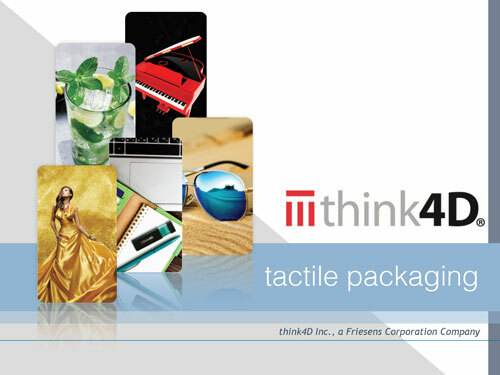 At think4D, our goal is to prepare innovative, premium packaging solutions with decorated and tactile features to give consumers confidence from first “sight” and “touch” that they are purchasing a high quality product. 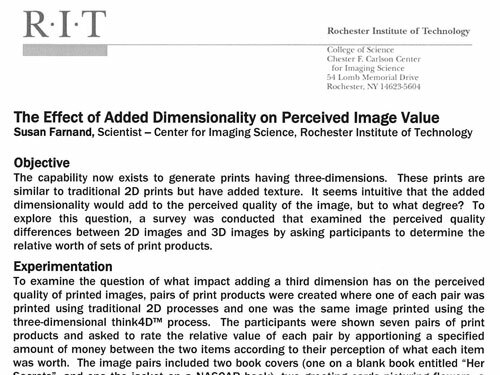 Rochester Institute of Technology found that 3D tactile packaging increased the perceived value of a product by 50% compared to traditional 2D packaging, and that consumers are substantially more likely to choose products advertised or packaged using think4D technology. See the full report for more details! Watch Clemson University’s Retina Tracking Study to see the proven advantages of plastic packaging! Their results found that plastic packaging is faster to find, receives more and longer consumer visual fixations, and consistently performs better than traditional box packaging in sales.